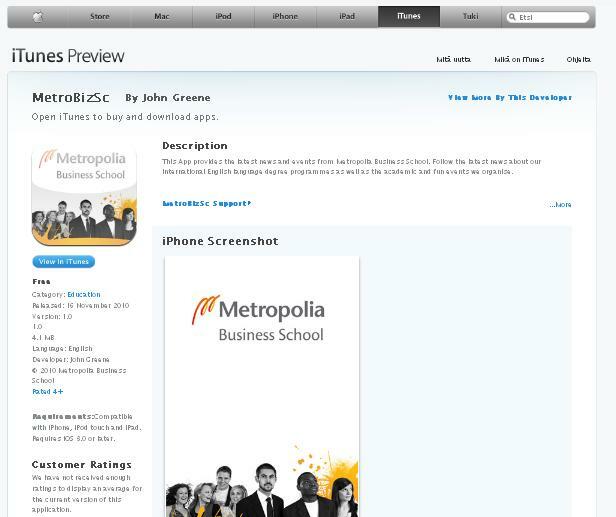 Metropolia Business School launched an Apple OS App at the MarketingTalks presentation Thursday 18.11.2010 at 13:00. The App is the first to be launched by an educational institute in Finland and one of the first in the Nordic market. Having researched the increase usage of Smartphones by the general population and in particular students it was decided to launch a new tool to reach and engage our audience. Smartphone adoption in the EU5 (U.K., France, Germany, Spain, Italy) has grown 41 percent in the past year to 60.8 million subscribers (Source:comScore). Many smartphones owners use their smartphone to access the internet and social network sites. Apps are increasing in importance for content access and delivery and students in particular are heavy users of Apps. Metropolia Business School wants to provide our students with the latest Metropolia Business School news, events and activities in a simple, timely manner and we believe that ‘MetroBizSc’ App does this. The ‘MetroBizSc’ App also provides potential students with a window into student life and the benefits of studying at Metropolia Business School. ‘MetroBizSc’ App makes available practically all our digital content to Apple Ipone/Ipod/Ipad users. Users of the ‘MetroBizSc’ App can access our website, Blog, Facebook, Twitter, Flickr pictures, YouTube video channel and much more at a simple press of their finger. 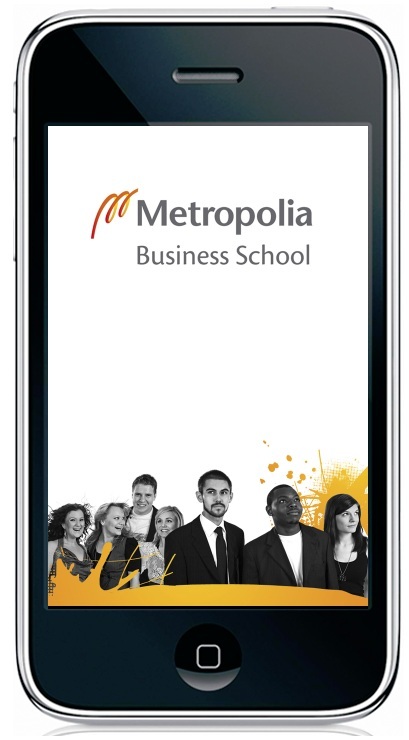 We hope students and others will utilise the ‘MetroBizSc’ App and our online content to make Metropolia Business School a community that we can all be proud of and have influence over. The ‘MetroBizSc’ App is available via Apple’s App store and Apple’s Itunes store and is FREE. You can also download it from here. You can find ‘MetroBizSc’ App by searching using the name or in the Education section. Go download it, rate it and tell everyone about it. Let’s get it moving up the Apps store chart and get some attention. The ‘MetroBizSc’ App is version 1.0 so send us a message via the message section (in the App) and tell us what you think and how we can improve it. We will look at options to release the app on other operating systems later in the year. A big thank you to appmakr the website we used to make the App and Besnik Shala for the use of his Mac.